Well to be honest we have to pick up the tour in Kathmandu and our round the world flights meant we could not do the easy route. Kathmandu is amazing. It has all the good stuff of India without, so far, all the bad stuff. People are happy and the weather is great. We are staying in an expensive (A$110/night including brekkie) hotel with pool to recover from the Delhi airport lounge. 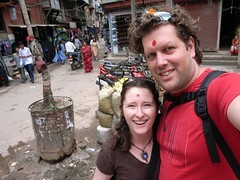 You can see from the photo that we already have had a blessing from a Krishna Sadhu, red mark on forehead and petals in hair, and are enjoying the manic but happy streets of Kathmandu.